Today we are pleased to present a guest contribution written by Reuven Glick at the Federal Reserve Bank of San Francisco and Andrew Rose at the University of California at Berkeley. The views expressed below do not represent those of the Federal Reserve Bank of San Francisco (FRBSF) or the Board of Governors of the Federal Reserve System. This blog is an updated version of FRBSF Economic Letter 2016-09, March 21, 2016. Economic crises in some European countries over the past few years have stirred up new debate about the benefits and costs of belonging to the Economic and Monetary Union (EMU). The costs of forgone national control of monetary policy have become particularly apparent for member countries like Greece. Whether the economic benefits of sharing a currency—lower trade costs, lower exchange risk, and greater price transparency—outweigh the costs is a key part of the debate. To make this comparison, one must measure how much a common currency benefits a member country. There has been considerable disagreement concerning the magnitude of the trade-stimulating effect of the EMU, or indeed of any currency union in which member countries use the same currency. This blog summarizes results from Glick and Rose (2016) regarding the effects of currency unions in general and the EMU in particular on international trade. In earlier work (Glick and Rose 2002) we estimated how the amount of trade between two countries was affected by whether they were in a currency union. We looked at more than 200 countries from 1948 to 1997, before the establishment of the EMU. We found that bilateral trade approximately doubled as a pair of countries formed and halved when a currency union dissolved. The relevance of this estimate for the EMU has been questioned on the grounds that it largely reflects the experiences of small dependent economies in currency unions with large anchor countries. In fact, as summarized in Head and Mayer (2014), more recent studies have estimated currency unions improve trade less than our earlier estimates suggest, on the order of 30% or less for the EMU. Our recent paper (Glick and Rose 2016) extends our analysis to include the effect of currency unions on international trade through 2013, which includes the introduction of the EMU. In accordance with our gravity model specification, we explain bilateral trade as a function of the GDP income of the two countries in each pair, the distance between them, and a host of other variables that may facilitate trade, such as sharing a border, a common language, membership in a common regional trade agreement like the European Union, or a similar colonial past. To this framework, we add a measure of whether or not two countries share a common currency or have a stable one-for-one interchange of their currencies. During our sample period, a large number of countries joined or left currency unions. By far the biggest recent event in monetary unions was the establishment of the EMU, which began with 11 member countries in 1999 and has since expanded to 19 members. To account for the possibility that trade effects for EMU countries may differ from that for other currency unions, which typically involve a developing country, we distinguish between the trade effects of EMU and non-EMU currency union pairs. To see what the data can show about the effect of currency unions on international trade, we start with the approach of our earlier work: We measure trade as the average of exports and imports between each pair of countries and use a fixed effects estimator that accounts for the many characteristics associated with cultural, historical, political, or geographic factors that affect the volume of bilateral trade, but are difficult to observe, let alone quantify. Using least-squares panel estimation, we find with this approach that currency unions have a positive effect on trade. The EMU is estimated to raise trade by around 50%, while non-EMU currency unions boost exports by over 100%. We also take account of more recent methodological developments in gravity model estimation (see Head and Mayer 2015). As Anderson and van Wincoop (2003) point out, the magnitude of exports between any two countries depends not only on their level of bilateral trade resistance but also on how difficult it is for each of them to trade with the rest of the world—what they call multilateral resistance.. We control for these multilateral resistance effects and hold constant all country-specific phenomena, including those that don’t vary over time, such as land area, and time-varying characteristics like GDP. We continue to control for country-pair fixed effects. With this second approach, the EMU still raises exports by roughly 50%, similar to our first estimation approach. Dis-aggregating the non-EMU currency unions does not affect this estimate, though we find considerable heterogeneity across other currency unions. For example, trade raises by 60% or more for members of the African CFA zone and countries tied to the U.K. pound, but declined for members of East Caribbean Currency Union and countries linked to the U.S. dollar. In other work, we show that if we focus on trade among the “older” members of the EMU, i.e. those who joined before 2007, trade still rises by more than 40%. We also estimate the effects of currency unions over time, including how much trade is affected before and after the year of entry or exit from a currency union. Figures 1 and 2 show the effects of entry separately for EMU and non-EMU currency union pairs, along with 95% confidence bands. The conversion to actual percent change in exports can be calculated from the exponential value of the log change plotted in the figures minus 1. 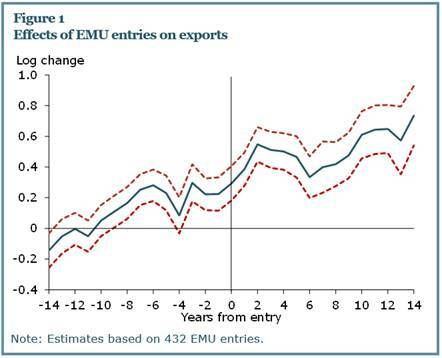 As shown in Figure 1, the EMU has a positive effect on trade even before entry, and it increases further in the years after entry. This is consistent with the view that the path followed by policymakers as they prepared to launch the euro was credible enough to lock in expectations about exchange rates before the euro’s formal adoption in 1999. This prompted exporters and importers to move earlier to take advantage of new market opportunities. The continued growth in the estimated effect of EMU in the years after entry is consistent with the view that there are significant lags before international traders respond fully to changes in the environment created by a new currency union. 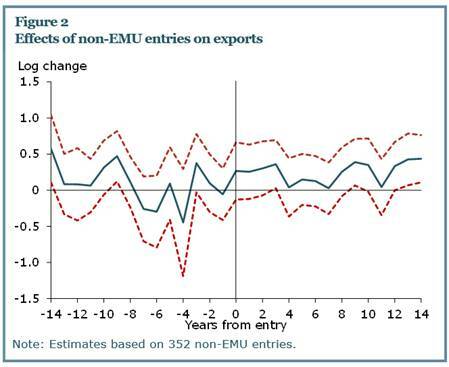 As shown in Figure 2, there is no evidence of increased trade prior to joining currency unions between non-EMU countries, though trade does increase afterwards. 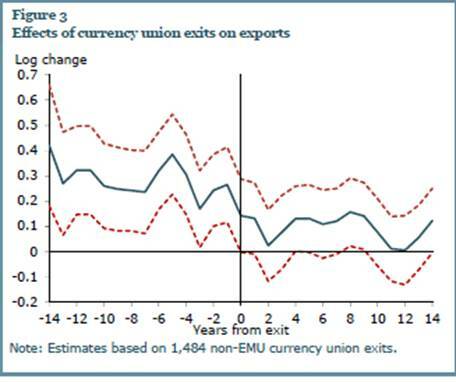 Figure 3 shows the effects of currency union exits over time; this is limited to non-EMU currency union members, since there have been no exits from the EMU to date. The results seem intuitive as well. The effect of currency union on trade is substantial before an exit. Upon exit, trade starts to shrink, though it lingers for a decade or more afterwards. How do our results compare with the literature? As noted earlier, the cottage industry has produced estimates of the trade effects of the Euro which are typically smaller (see the citations in our paper (2016) as well as in Head and Mayer (2014)). However, these studies invariably focus on the effects of the EMU, excluding other currency unions, and use samples that are smaller and shorter than ours. Limiting the sample to European and industrial countries precludes any direct comparison of the effects of EMU and other currency unions. Moreover, almost all of these papers include time trends for European Union pairs to control for ongoing economic integration among these countries. Including such trends significantly masks the possible euro effect on trade, both before and during the actual implementation of EMU. Indeed, we show that the span of the data set, across both country and time, strongly affects the estimated effect of currency union on exports. In particular, the effects of the EMU fall significantly when the cross-country span is reduced to including only industrial countries or upper income countries. Thus, we conclude that a complete set of data, spanning a large number of countries and years, is critical when estimating the effect of currency unions on trade. To summarize, our least squares panel results with time-varying country and dyadic fixed effects, which we consider to be our most plausible econometric model, deliver large positive effects for the effect of EMU membership on exports of 40-50%. Anderson, James E., and Eric Van Wincoop. 2003. “Gravity and Gravitas: A Solution to the Border Puzzle.” American Economic Review 93(1), pp. 170–192. Glick, Reuven, and Andrew K. Rose. 2002. “Does a Currency Union Affect Trade? The Time-Series Evidence.” European Economic Review 46(6), pp. 1,125–1,151. http://faculty.haas.berkeley.edu/arose/RecRes.htm#Reverse. Forthcoming European Economic Review. Head, Keith, and Thierry Mayer. 2014. “Gravity Equations: Workhorse, Toolkit, and Cookbook.” Chapter 3 in Handbook of International Economics, volume 4, eds. G. Gopinath, E. Helpman, and K. Rogoff. Amsterdam: Elsevier, pp. 131–195. This post written by Reuven Glick and Andy Rose. This entry was posted on June 3, 2016 by Menzie Chinn. This is a very interesting post, thank you. I have some questions if you would care to answer them. 1) I assume this research implies that UK trade with the Eurozone would be about 50% larger had the UK been in EMU. Would you agree with that? 2) Since increased trade should in general improve welfare, is there a way to estimate the effect of increased trade on the level or growth rate of real GDP or some other economic welfare measure? I think people would be interested in that. 3) Why do you think this result is true? 50% seems very big. Why should the effect be so large, especially since there is ample ability to hedge foreign exchange transactions in a non-currency union? 4) Would you argue from these results that countries ought to be in currency unions? What about the potential costs of currency unions, i.e., a common monetary policy might be welfare subtracting if it is meant to cover very disparate economies? When will the EU pull-out of the economic malaise, what policies are necessary and how do the policies get implemented? It seems like the malaise will continue for the indefinite future and if the US is faltering given the poor jobs growth results, the US may not be able to be an engine to spur world GDP. The world seems to be stuck in a low-level equilibrium that requires some large shock to get the world economy moving at a faster pace. Low or negative interest rates don’t provide much income for savers who could increase consumption if rates were at “normal” levels. If I read correctly, the weighted average interest rate on US treasury debt is about 2.0 percent. What happens to the US budget when rates increase, given the enormous increase in debt over the past decade? We need economists to show us the way. In the E.U., there’s too much leisure time and too little labor time, e.g. reflected in low labor force participation rates and high unemployment rates. Leisure is financed by government debt rather than taxes. I doubt even higher taxes on workers will solve the problem. leisure time is not a problem if productivity is high. in addition, people spend money in their leisure time. too much labor time probably provides too much labor supply, which is a problem in a demand constrained world? this is probably a negative for wage growth? there appear to be some interesting experiments occurring in europe regarding the length of the work week, and we may know more answers in a couple of years. Demand is constrained when national income grows too slowly, because of too much leisure time. Government debt subsidizing leisure time is limited. More “experiments” are unnecessary. you can see the “experiment” in sweden has potential. seems foolish to claim experiments are unnecessary. these experiments are data. fortunately, the data has some positive things to say on a shorter work week. why would you think the experiments are unnecessary? these results imply you may be incorrect in your assumptions on leisure time. is that why they are unnecessary? Let me know when you figure out the difference between productivity and output. Here’s a hint: If I work half as many hours, my productivity will likely rise, but my output will definitely fall. Peak, nobody is claiming to cut the work week in half. You are being ridiculous in trying to prove a point which is not supported by the data. As my productivity increases, I can cut my work week and still maintain the same output on balance. Now I have more leisure time-and people often spend money in leisure time. Of course, this does not work if the employer does not reward the increased worker productivity with higher wages. And that is a problem with a lot of modern managers, failure to reward worker productivity results in unmotivated workers. Is the assumption that ANY trade is good? Even a highly unbalanced trade that generates big trade surpluses and big trade deficits? It looks like this is the type of trade that happened in Europe with Germany accumulating a huge trade surplus and the countries in southern Europe accumulating trade deficits. it’s a very interesting quantitative estimate of EMUs outcome, but volume of trade has no economic significance in itself. an assessment about welfare gains would be useful.